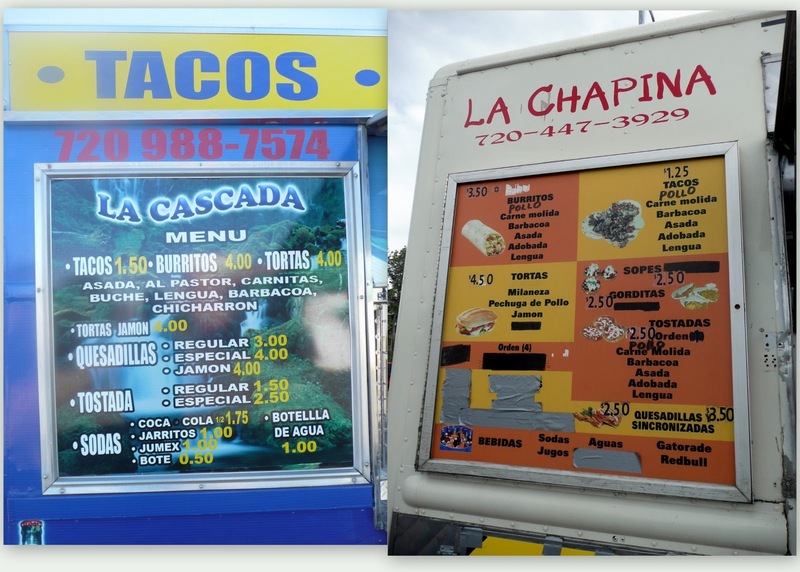 In the world of breaking taco news, shops and trucks pop-up out of nowhere and then disappear just as quickly. This is one reason that I have made a point to not get caught up in keeping current with any food trends, openings or general hoopla associated with the food world (the other reasons are that no one tells me and I don't get out enough). My news for this post is that a new taco truck that I reported on this summer has since moved, closed or was possibly bought out by a taco-truck corporate giant. While "taco-truck" and "corporate giant" might be a paradox (though as this food truck boom continues to explode don't be surprised to see a Wack Arnolds truck rolling up to your office building sooner than later), there is one player in the Denver taco truck scene that is omnipresent. As far as I can tell La Cascada started out as a single sparsely decorated truck (and apparently a bad one at that), and somehow has managed to explode into a slickly painted mega-fleet. Over the years I've counted at least four around the city--mostly on the East side-- and it looks like I can add one more to the list. Yes, the feeble yet decent La Chapina on the corner of 17th and Peoria has been replaced. The scenario I imagine involves some SUV-driving thugs hired by Cascada making La Chapina one of those offers they couldn't refuse. It is, after all, located on a prime piece of late-night taco real estate on the lot of the windowless bar (those are the sketchiest kind) Shepes's (sic) Rincon. And true to the deep pockets that I imagine La Cascada has, they even included lighting under the panels so the nocturnal eaters spilling out of the Rincon can easily put fingers to taco and taco to mouth. This is all speculation of course. To be fair, even though they all operate under one waterfall logo, I believe the Cascada trucks are individually owned. For all I know La Chapina didn't make it for other reasons and La Cascada just hovered around like a vulture and set up shop after all the remains were swept away. There were signs that La Chapina was operating on a tight budget. Take for example the use of duct tape on the menu, something the efficient La Cascada machine would not allow. La Casacada is no longer toxic as suggested by this 2005 review (by the true authority on Denver's taco trucks). I ordered an asada and a carnitas. They were generously filled with flavorful meat, topped with a pico de gallo (that is what "con todo" gets you) and served con copia (two tortillas--corn of course). My friend also had some barbacoa. They were good meaty and greasy tacos of generous proportions that would become irresistible when stumbling drunk out of a bar. The red salsa was a little sweet, I would guess it was made with canned tomatoes. The green tomatillo and the avocado-based green were better, though neither had too much bite. All the salsas were encased behind plexi-glass doors with the rest of the fixin's-- this place is really quite fancy. If you go outside at all and have ever seen a taco truck in this town then it is likely you have seen a truck from La Cascada. It is good, but a taco truck to me speaks to individuality and a unique experience-- not uniformity-- so there is something about an apparent monopoly of food trucks that is ironic and unappealing. That being said, there was nothing wrong with La Cascada's tacos. In fact they were hearty, greasy and flavorful; and with the amount of tacos I eat in this town it is inevitable that I will be there at some point again.